Advertising. Bloodstained. Cold-blooded. Epileptic. Fashionable. Hobnob. Moonbeam. New-fangled. Puking. Swagger. Worthless. Zany. Those are just a sample of the many words William Shakespeare invented. In fact, some say he invented somewhere between 1,700 and 2,200 words — possibly more. It’s no surprise the English language owes a massive debt to Shakespeare. But Shakespeare doesn’t have a monopoly on inventing words. He wasn’t the first to do it, and he certainly wasn’t the last to create new words. But why make up words to use in your content marketing? Why not just stick with the ones we’ve got? Good question. Fortunately, I’ve got an answer. The reason is simple: to get people to stop what they are doing and pay attention to what you wrote. Strange words will do that. Particularly in headlines. 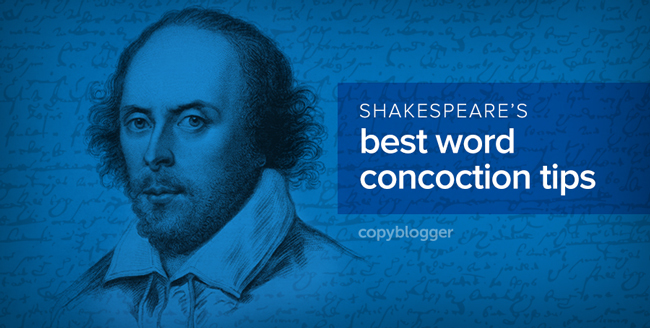 Let’s look at five ways Shakespeare invented words that will help you invent your own words for your content. Playing around with words drives language purists nuts, because it’s lazy to table an idea or shoulder the blame. But if you google “verbing,” you’ll realize this is a pretty common phenomenon and something we don’t need to be afraid of. Shakespeare certainly wasn’t. When you break a step on a porch, it then becomes a broken porch. Or when you filter your water during a backpacking trip, you can then relax by the fire and enjoy filtered water. And if your companion snores while he sleeps, you can kick him without fear of violating some law against assaulting snoring men. Many of the words you see in the introduction to this article are of this variety. The list of available prefixes and suffixes is long, which is one of the reasons the English language is extremely flexible. Certain words just come out of nowhere. And thanks to courageous and creative souls, we can now say totes (totally) and noob (beginner). Let me close with this: I’m accused of having bad hearing all the time. My lovely wife says one thing, and I respond with what I thought I heard. And then I tuck away the word I just created, thinking: That will make a headline happy someday. So, what are your tricks for making up new words? Got any examples? Share in our LinkedIn discussion.